The Virtual Cell Based Assay (VCBA) is an in silico model that simulates the biokinetics of chemicals in in vitro test systems. Simulations by the VCBA can indicate the degree to which the bioavailable concentration varies across chemicals and experimental conditions, thereby providing important contextual information when comparing the results of different in vitro toxicity experiments. The simulated results can also be used to support in vitro to in vivo extrapolation of toxicity data, especially when the VCBA is coupled to a physiologically based kinetic model. The VCBA requires only a limited number of physicochemical properties as input parameters to model the fate of a chemical in the in vitro environment; optionally, in vitro toxicity concentration-response curves can be used to optimise the toxicity and effects model. 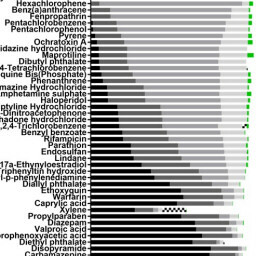 In this work, we selected 83 chemicals previously tested in vitro and used the in vitro data to optimise the toxicity and effects model, simulating the 3T3 BALB/c cell line in a 96-well microplate with 5% serum supplementation. We then used the optimised parameters to simulate alternative experimental conditions. By incorporating a diverse group of chemicals, the simulations show the impact of different physicochemical properties on chemical fate and how the different partitioning (to protein, lipid and plastic) and kinetic (evaporation and degradation) events are intrinsically connected. The results of VCBA simulations were interpreted in the light of the domain of applicability of the different QSARs incorporated in the model and the underlying assumptions and uncertainties of the VCBA. Proença, S., Paini, A., Joossens, E., Sala Benito, J. V., Berggren, E., Worth, A., Whelan, M. and Prieto, P. (2019) “Insights into in vitro biokinetics using Virtual Cell Based Assay simulations”, ALTEX - Alternatives to animal experimentation. doi: 10.14573/altex.1812101.